This evening we are gathered to celebrate the 6th anniversary of the founding of the Young Icebreakers. I wish to thank you for your kindness inviting me to speak at 5 of your anniversary celebrations. On behalf of the Chinese Embassy I give you the warmest congratulations! 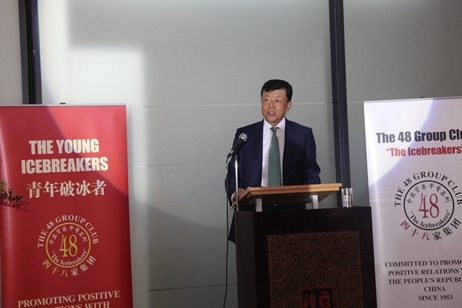 The Young Icebreakers were launched 6 years ago to carry forward the spirit of the ‘Icebreakers’ and advance China-UK relations. · We have more comprehensive high-level dialogues. · We have deeper political mutual trust. · There is strong momentum of trade growth despite the adversities of the financial crisis. 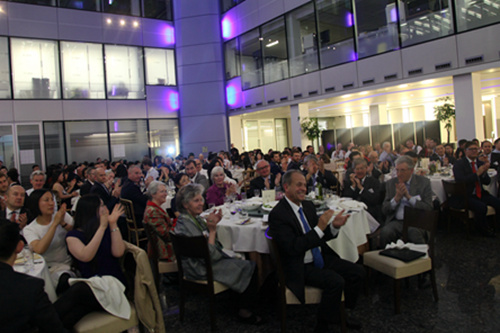 · And through robust ‘People to People’ dialogue and exchange, the Chinese and the British are getting ever closer. I believe everyone here will agree with me that China-UK cooperation is getting stronger and our shared future is getting brighter. We could not have come this far without your contribution both as individuals and as a group. Mr. Pearce has asked me to talk about the prospects of Chinese investment in Europe, particularly in the UK. I will take the liberty of expanding that subject into a bigger picture, by discussing investment in China, domestic and foreign, and Chinese investment overseas. I believe this more complete picture will contribute to a better understanding of the subject Mr. Pearce proposed. First, investment's role in China's growth is modestly ‘LESS’ than before. There are 3 main drivers of China's economy: export, investment and consumption. Export ranked top in the 1990s. Since 2002, investment has taken the lead. However, reliance on export and investment has led to growing issues with balance, coordination and sustainability. In such context, the Chinese government has been working on transformation of the growth model. Efforts are being made to generate more demand from within, to spur growth of consumption, and to diversify and rebalance the drivers of growth. This means the role of investment is being tuned down. But, tuning down is not turning off. With improved structure, direction and quality, investment will be a leaner but meaner driver for growth. The investment will in turn mobilise more resources in these fields. Now I come to the second key word - ‘IS’. China's appeal to foreign investment ‘IS’ on a steady rise. Some say China's investment environment is not like before. Some assume that since China is no-longer capital-starved, it will not open further to foreign investment. It is a clear fact that, as China restructures its economy and wage costs rise, labour-intensive industries are not as price competitive as before. This trend does show in foreign investment figures in that specific category. But, paid-in foreign investment in 2013 still registered 117.6 billion dollars, and a 5.3% growth is above par in the global context. According to surveys among business chambers of foreign companies in China, over 90% of foreign businesses are making profits and prepared to invest even more. So, the bigger picture of China's appeal to foreign investment hasn't changed. What's changing is the direction, structure and fields of investment. I believe these measures will make China more appealing to foreign investors. But, I also want to stress the point that all foreign businesses in China need to operate within the confines of the law. Otherwise, it has to face the full weight of the law, no matter where it comes. Now we come to the third key word “MORE”, i.e. Chinese investment overseas is picking up "MORE" speed. · China’s outbound investment only started in late 1970’s. · Outbound investment was not very much a growth story for many years. · By 2007, the cumulative Chinese investment overseas in non-financial sectors was only 73.3 billion dollars. · It certainly has been picking up speed since then. By last March, the figure grew to 545.6 billion dollars. The figure in 2013 alone is more than the sum-total between late 1970s and 2006. UK is an excellent example in this regard. China invested more in Britain in the last 2 years than it did in the previous 30 years. · First, it is no longer only focused in London. SAIC has invested in R&D and assembly facilities in Birmingham. BECG is investing in Manchester Airport development. o Cultural and creative industries. o Sanpower has recently acquired the House of Fraser. o All of these companies are in the private sector. Changes in Chinese investment is a microcosm of China's reform and opening up. It evolves as China works hard to catch up and integrate with the world economy. China will not pause or stop. China will continue to renew itself on its quest of the two centenary goals, the ‘China Dream’, as well as growth and prosperity around the world. Today, the breadth and depth of China-UK cooperation is greater than ever. 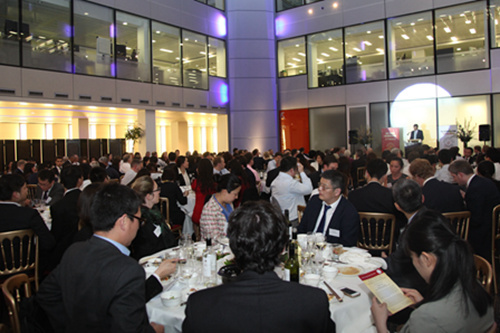 There is a golden opportunity to carry Sino-UK links even further. As a foundation we must build up mutual understanding between our two peoples. It is my genuine hope that the Young Icebreakers can carry forth the ambition and enthusiasm of those before you. I urge you to grasp these opportunities and materialise the huge potentials of China-UK cooperation. The stage is set. Time and momentum is on your side. Only sky’s the limit.